With beautiful towns, rolling hills and coastal plains (check out our map of Uruguay), this is the holiday destination of choice for the neighbouring Argentinians. Why not head out there to learn Spanish? Just check out the other details we have for you before you make up your mind! Uruguay is a wedge-shaped country down towards the south of South America, squeezed between the continent's two largest countries, Brazil and Argentina. Still, it is not totally landlocked. Its South Atlantic Ocean coastline is the same length as either of its land borders. If you plan to spend your whole stay in Uruguay (and there's plenty of lovely stuff to do there), then you may find ITMB's Uruguay Map with Montevideo City Plan by International Travel Maps your best bet. Combining detailed route and physical information with the capital city's street plan is all designed to make your visit easier. Click below to order your Amazon copy now! If you're planning to combine exploration of this lovely country with others, then your choice of map will doubtless depend on where you're considering for your tour of southern South America. Nelles Southern Argentina/ Uruguay Travel Map with Falkland Islands. Click here to order now if this map floats your boat! For those who prefer to experience more of South America, Zagier & Urruty Publications have produced the Argentina/Chile/Uruguay/Paraguay Map. Get your copy from Amazon by clicking right here! Index: Map of Uruguay. Masses of Facts and Figures on Uruguay. 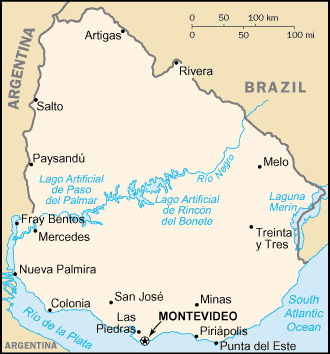 Map of Uruguay from Cia World Factbook.